Wholesale inflation advanced in July more than analysts expected but still continued moderating as the global economic slowdown lessened demand for commodities. Energy prices declined for the ninth time in 10 months, according to the Producer Price Index, from the Bureau of Labor Statistics. The core rate for wholesale inflation, which excludes the volatile food and energy prices, rose 2.5% from July 2011, down from a gain of 2.6% in June and the lowest rate since May 2011. The Commerce Department said retail sales rose 0.8% in July, which was much higher than forecasters expected. All sales categories showed improvement from June, when retailing sank more than previously estimated. Compared to July 2011, retail sales were up 4.1%, which is higher than the June rate but behind the long-term average of 4.5%. Retailing is a key indicator because consumer spending accounts for 70% of the Gross Domestic Product. American businesses did not adjust inventories enough to accommodate falling sales in June, Commerce said in a separate report. The resulting inventories-to-sales ratio rose for the third month in a row, to the highest level since Nov. 2009. Idle stockpiles could eventually dampen further hiring and business investment. In another sign of the weak economy, consumer prices remained subdued in July. The Bureau of Labor Statistics said energy prices dropped for the fourth month in a row and were 5% lower than in July 2011, despite the first rise in gas prices since March. Food prices climbed just 0.1% vs. 0.2% in June. 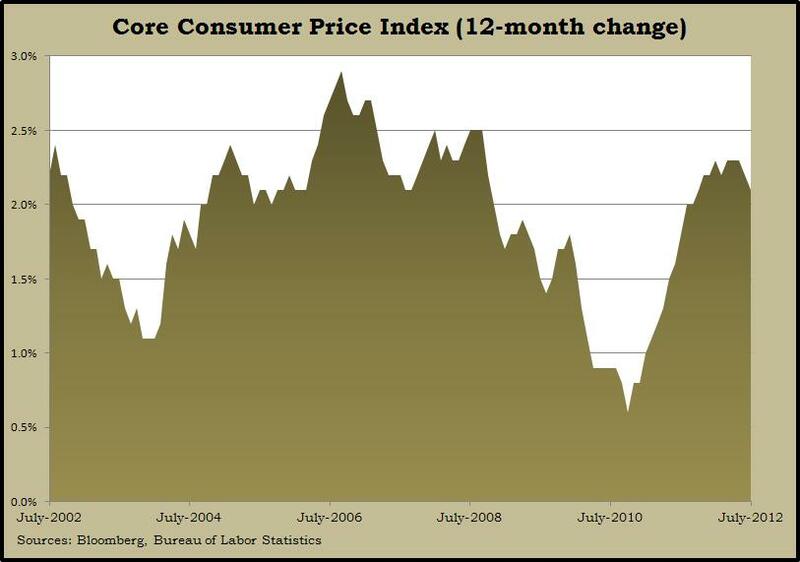 The core Consumer Price Index, which factors out volatile food and energy costs, increased 2.1% in the latest 12 months, the lowest rate since October. The housing industry continued to show signs of revival in July with new construction of housing up 21.5% from the year before. The annual rate of housing starts was down 1.1% from a relatively strong June, Commerce said, but building permits, a harbinger of future housing – jumped 6.8% in July to their highest rate in four years. The moving four-week average for initial unemployment claims dipped for the seventh time in eight weeks, reaching its lowest level since late March. Labor Department data showed new jobless applications were 45% lower than the recession peak and 10% below their level a year ago.